Check out today's prep team spotlight on the North DeSoto Griffins! LAFM TV Show! Episode 21 Now Available On YouTube! March 5, 2019	Comments Off on LAFM TV Show! Episode 21 Now Available On YouTube! LAFM TV Show! Episode 20 Now Available On YouTube! February 27, 2019	Comments Off on LAFM TV Show! Episode 20 Now Available On YouTube! LAFM TV 13th Season! Episode 21! February 26, 2019	Comments Off on LAFM TV 13th Season! Episode 21! We have a great show this week with special guests McNeese State Head Football Coach Sterlin Gilbert, Evangel Christian Academy Head Coach Byron Dawson, Evangel Christian Academy junior quarterback Blake Shapen, Bourgeois Physical Therapy and Sports Rehab owner Christian Bourgeois, and so much more! Click the link for more information! LAFM TV Show! Episode 19 Now Available On YouTube! February 20, 2019	Comments Off on LAFM TV Show! Episode 19 Now Available On YouTube! LAFM TV 13th Season! Episode 20! February 19, 2019	Comments Off on LAFM TV 13th Season! Episode 20! 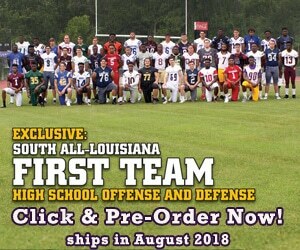 We have a great show this week with special guests Crescent City Sports CEO/Owner Ken Trahan, WBOK Radio Sports Analyst Ro Brown, Alexandria junior DT Jacobian Guillory, Denham Springs junior QB Luke Lunsford, and so much more! Click the link for more information! Check out today's prep team spotlight and recruiting update on the Mansfield Wolverines! LAFM TV Show! 13th Season! Episode 18 Now Available On YouTube! February 13, 2019	Comments Off on LAFM TV Show! 13th Season! Episode 18 Now Available On YouTube! Check out today's prep team spotlight and recruiting update on the Haughton Buccaneers!